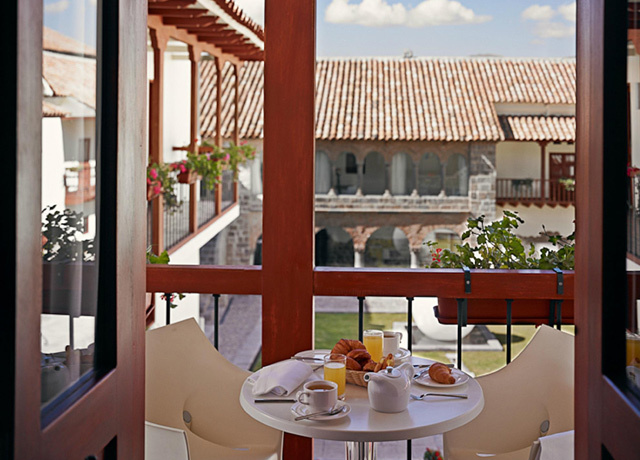 Nestled in the heart of Cusco, a city high in the Peruvian Andes that is famous for its mix of Inca and Spanish culture, the Casa Cartagena is a historic hotel with 16 unforgettable suites located close to the main square. Careful restoration of the carved stone walls has earned this historic house recognition as a UNESCO World Heritage Site. The colonial architecture overlays an ancient Inca complex that was once occupied by reigning nobility. Luxury blends harmoniously with history as all the rooms surround a stunning and peaceful patio—a configuration that remains true to the original design. Each suite has a private balcony to enjoy breakfast or a glimpse of the stars. Plush beds include down comforters and hypoallergenic pillows, plus central heating and an enriched oxygen system to help adjust to Cusco’s high altitude. Decor is contemporary with splashes of colorful Peruvian flair. En suite bathrooms are equipped with robes and slippers, a bathtub with bathing salts, Tatami-style shower, bidet and toilet. Additional room amenities include free Wi-Fi, LCD television with cable, in-room safe and a butler at your service. Guests are encouraged to join the hotel’s pisco sour lesson, where you can glean detailed instructions for preparing Peru’s national cocktail, or rejuvenate at the Ooya Spa, which is inspired by Inca culture and features organic products using ancient Peruvian ingredients like Andean mint, salts and coca leaves. At the hotel’s historic La Bodega de la Chola restaurant, savor local cuisine in a space where Pablo Neruda was once inspired to write poetry and Che Guevara reveled away his bohemian nights.